We couldn't imagine a struggle that better symbolizes the burgeoning conflict between the globalist "Davos Man", who has flourished in the years since the financial crisis (largely because central banks helped transform it into a dip to buy), and regular, working people than the one highlighted this weekend by Bloomberg News in a report about the simmering anger locals feel toward the wealthy MOUs who flock to their mid-tier ski town for a few days every January to revel in the excesses of the stratified world these outsiders helped to create. Davos locals are growing increasingly frustrated with the traffic congestion that the conferences attendees (it's expected to draw 3,000 guests this year, the largest crowd in its history) and their limos bring to the town, with the 11,000 residents wondering why they can't just take public transportation like Swiss central bankers and government ministers do? "People wear leather dress shoes and then use the limousines because they don’t want to slip on the ice," said Ladina Alioth, a teacher and mother of three recently elected to the local legislature. She’s proud to host the WEF and but says last year it was too disruptive. "I wear boots and pack the shoes I wear indoors - why can’t they do that too?" In a sense, these complaints might seem like biting the hand that feeds. After all, the WEF is a boon to local businesses and generates an estimated 2 million francs ($2 million) in tax revenue for the town. But that hasn't stopped the townspeople from resisting an increase in security for the conference that would likely lead to even more congestion. But given that many of the most important events associated with the conference - that is, the exclusive parties and cocktail receptions - are held far from down town Davos, where the conference takes place, having a car at one's beck and call seems appealing. 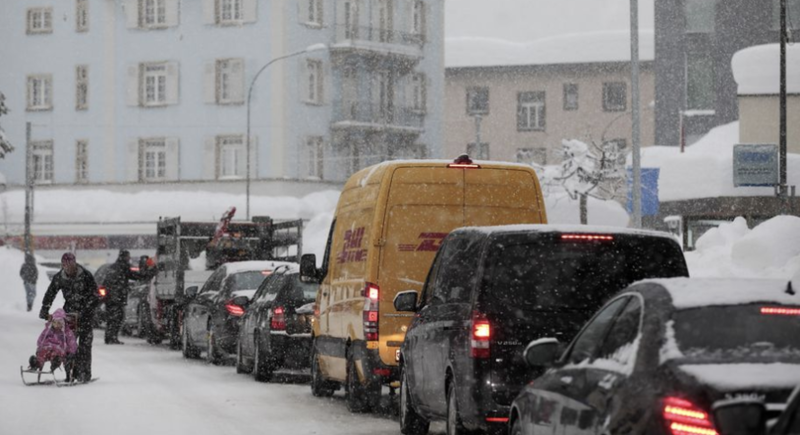 "Over the last several years, the amount of private cars and traffic in Davos has increased significantly," said Soumitra Dutta, a professor at Cornell and a regular attendee who takes a WEF-organized bus from Zurich airport. "I am not surprised that local residents are not pleased with the congestion." Though there is one group of locals who see the rise in automobile traffic as an unmitigated positive: Swiss car-service owners. Though they're not the only slice of the local business community that benefits from the conference. A private car from the Zurich airport to Davos can cost up to 1,500 francs, compared with 50 francs for a first-class train ticket. But often taking the train is quicker. Round-the-clock on-call car service for the duration of the conference can cost as much as 20,000 francs. Luxury does have its price: Traveling to Davos with a hired car from Zurich airport costs about 800 francs to 1,500 francs, with only marginal - if any - time saving over the train. A first-class rail ticket is only about 50 francs, though you have to change trains. The WEF ’Round the clock service during the WEF, including pickup and drop-off at Zurich airport, can cost 20,000 francs. "The people of Davos complain, but they also earn a lot," said Joerg Grossmann, who owns a limo service in Zurich that sends about 35 cars to the Forum. It may look "very excessive, but it also offers people flexibility and security," he said, explaining that some insurance companies even require that one be on-hand. For what it's worth, the WEF says it has taken these concerns "to heart" and has held meetings with authorities to address them. But perhaps the anger felt by Davos residents isn't solely a reaction to the elites' behavior during the conference. Maybe - just maybe - it stems from a deeper sense of injustice. Because, as Bloomberg pointed out in a separate piece, the average Davos billionaire has seen their wealth multiply since the financial crisis, as the gap between the wealthiest 0.1% and the rest of the world grows ever wider. Data from UBS and PwC Billionaires Insights reports show that global billionaire wealth has grown from $3.4 trillion in 2009 to $8.9 trillion in 2017. And as the world becomes increasingly unequal, even these seemingly minor perceived slights can take on a whole new significance.